Join our cause and treat yourself to a one of a kind luxury giving back experience that will change your life forever, all while earning CEU credits. This 10 Day/9 night all inclusive privately guided Malawi and Zambia safari is an incredible value. Don’t miss our breathtaking Victoria falls experience. Ready to check off the ultimate bucket list? Finish the trip into the heart of beautiful Lower Zambezi staying at an ultra high end exclusive Safari lodge. See itinerary for this specially negotiated pricing. This giving back safari adventure is an unbeatable value. I know you will not find a like itinerary that can approach what we are offering that includes international flights within Africa and the important donations to the causes we are participating in. We only stay in intimate safari camps with under 20 rooms and we cover many experiences usually on the optional list. You can pay less on the front end, but you will not have the high caliber giving back experience we provide. Join us for our Zambia/ Malawi adventure, and stay for our incredible Vic falls/Lower zambezi extension. It is the perfect compliment, with significantly different experiences than the first portion. We appreciate the difference nurses make. We look forward to taking Nurses on the adventure of a lifetime while sharing the gift of giving back to the world. Plus, you’ll get the opportunity to earn up to 25 CE Units towards your continuing education along the way. Amazing? We think so, too! We provide the perfect mix of self-study CE courses and group CE lessons during your vacation. Learn what you are interested in during self-study, and efficiently move through course work in our fun group environment. Complete your units in half the time with our efficiently guided courses! Support good causes: We will discover this area’s hidden secrets while contributing to its sustainability by working with great non profits. An intimate, small group experience: Knowledgeable guides and no more than 15 guests assure you a very special trip. Get a paid vacation: Many employers offer allowances of $1,000 to $4,000 per year toward continuing education, including travel expenses. Check your benefits package to see how much of your adventure will be free! Paid time off: Get paid like you were working while having fun and earning CE Credits! Most employers will pay between 20 and 50 hours per year for continuing education. Check your benefits package to see how much paid time off you can apply toward your adventure! Complete all requirements in style: No more seminars in stuffy corporate environments. Cover up to 30 units of CE while having the experience of a lifetime! We help you succeed: By working with Destination Earth, you will have support to complete all of your course requirements with ease. We dedicate plenty of time on our trips to take all needed courses and complete the tests to receive your credits. You’ll even complete credits while en route to our exciting daily adventures, and you’ll be surrounded by other adventurous nurses to discuss topics and assist each other in an inspiring setting. Join us for our Malawi/Zambia Safari at $2,995 (Single Supplement + $745), add on our must see vic falls to Absorb the whole experience for just $4,395! (Single Supplement + $1,050). While you are already in Africa, add on a 5 star luxury safari into the lower Zambezi for an additional $2,495 (Single Supplement + $695). For more information, please contact us. Visit remote areas of some of Africa’s most sought after game parks, visit the largest fresh water lake in the world, and join a village in changing their lives for the better while celebrating life with a Boma dinner experience not to be missed. From boating just a few hundred meters from the thundering falls of the largest waterfall in the world to exploring it from the top in a helicopter, Victoria falls is an experience you will not forget. Our village boma dinner is an amazing opportunity to deeply connect with our African friends and truly participate in their life experience (included). We have the privilege of saving the women of the village from smoke borne diseases as we take a portion of the trip funds (paid by Destination Earth) and donate it to creating ventilation in village wood burning kitchens. Join our cause and treat yourself to a one of a kind luxury giving back experience that will change your life forever. Not ready to book yet? Learn more about our trips. We will spend a total of two to three hours working on a social project changing peoples lives and supporting the eco system. Every trip over $1,000 of your money goes into making big changes, and we hope that you will help us to raise money for the cause through the support of your friends and family. Quality Boutique accommodations, most meals are included along with private transportation. Most days have a variety of inclusive activities. Our group size will remain intimate allowing us to move swiftly, have more interaction with your guide, and tailor experiences to your specific interests. Pampered and rustic Experience. We will be in both wealthier urban areas and poorer rural areas. You will be spoiled with intimate boutique hotels, and fine dining (included). You will also get to stay with the people, often featuring a night or two home stay with the locals. These safe but down to earth experiences remind us what we have, and how people with so much less live often with so much more peace and happiness. These trips allow you to see what other tour groups never will, giving you memories you will have for a lifetime. Isn't it worth it to sacrifice a little luxury for a life experience? Jud Yaski is an adventure veteran with over 22 years of international travel, extreme sports, and corporate hospitality under his belt. Jud has traveled throughout South East Asia, Hawaii and South America for the last 20 years. His love for these countries and its peoples, along with inside knowledge through months of travel to each location are reflected in the extraordinary adventures he will be sharing with you. Engulf your senses and see the true Africa. The first 3 days will immerse you into the rich Safari experience of Liwonde National Park. Liwonde reserve is situated at the southern tip of Lake Malombe in southern Malawi. Although Liwonde is one of Malawi’s smaller parks, it is arguably the most exclusive of all the game parks in the country. Malawi’s main river, the Shire, forms its western boundary and is the reserve’s lifeblood. With plentiful wildlife including hippos, kudus, elephants, crocodiles and even black rhino, the park has become one of Malawi’s premier wildlife-viewing destinations. The birding is excellent and a favorite sighting among birdwatchers is the Pel’s fishing owl. 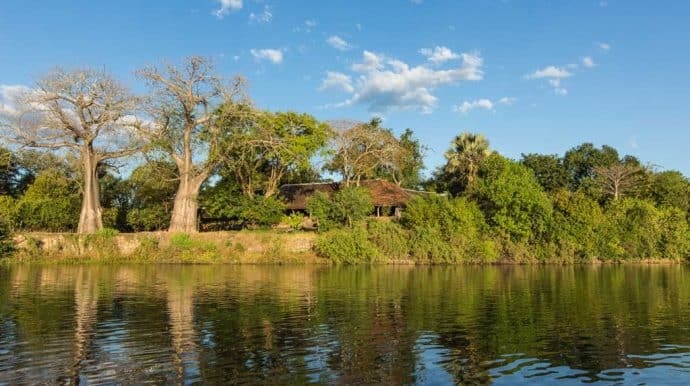 Visitors can look forward to a wide selection of activities including excellent wildlife viewing, canoeing and boating safaris in our well-positioned safari camp. We’ve made it easy to get answers to common questions. Check out our complete guide to packing for your trip. Find out about trip refunds, deadlines, and other important information. The Entabeni Safari Conservancy offers a true African bush experience with 55 mammal species (including lion, buffalo, elephant, leopard and rhino), 300 plants species and 380 bird species. Visit the Sterkrivier people and work with them on a project to better their community. Take South Africa Travel to the next level by joining a trip with Destination: Earth. Contact us to learn more about our eco-travel adventures. *Starting prices based on double occupancy. Join for FREE for inspiring stories from the Non Profits we work with, updates on our latest adventures, and eco travel tips for giving back however you travel. "DO IT!!! Steve, Jud and Tom, our guides were the best hosts and had crazy knowledge about where the best places were. Spectacular and breath taking!" "I had a great time this past week and want to thank you for all the work you and Jud and Joe did in planning the adventure. Your willingness to change plans and be so accommodating made the trip extra special for me. And of course, the humor. What can I say? I felt like we were all part of a close family. I have told several people about Destination Earth and hope they will contact you. Thanks again, Kathy"
Off the beaten path, small group travel company committed to giving back to the local communities of the places we visit. © Copyright 2019 Destination Earth. All Rights Reserved.